The final round in any contest can be a really exciting affair and the NHMC Cadwell Park Junior Rally on 17th November 2018 was no exception. Nine Junior 1000 Ecosse Challenge crews made the long trip down to Lincolnshire. Two Junior 1000 Ecosse Challenge drivers started the event with the potential to become the 2018 Champion. But only one could come out as 2018 Champion and that was Lewis Haining from Dumfries. After a difficult season, Haining (Skoda Citigo) exited the final stage 6 seconds ahead of his great friend and rival Johnnie Mackay (Suzuki Alto) from Aberdeen. This gave Haining a final 4 point lead in the Championship and he claimed the ‘2018 crown’. Co-driver George Myatt was in a similar situation and secured the 2018 Champion Co-driver position also. However, the day had dramas for both drivers. 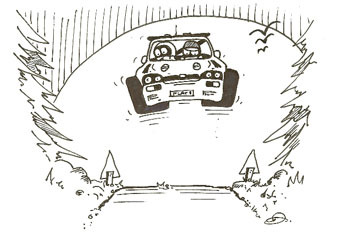 It started badly for both of them with problems on the first stage, but it was Mackay who came out best to lead by 3 seconds. Haining responded and ended up 5 seconds ahead of Mackay at the half way mark. By stage 5, darkness was starting to set in. Haining continued to ease ahead of Mackay, but a spin from Haining on the penultimate stage reduced the deficit to 2 seconds going into the final stage. Haining really got his head down and added 4 seconds to his advantage on the last stage to finish 6 seconds up on Mackay. It couldn’t have been any closer at the end of a fantastic year for the two brilliant young drivers. Joy for Haining – despair for Mackay. And making their presence felt all day were Andrew Blackwood/ Richard Stewart (Citroen C1). They finished just behind Mackay/Reid to take the final J1000 Ecosse Challenge podium position. A couple of other crews suffered some drama as well. Aaron Webster/Graham Wild (Nissan Micra) lost a lot of time when the bonnet flew up and damaged the screen. But deft use of some plastic sheeting and tank tape got them out for some more mileage and to record a finish. The other ones who lost a good position were Fraser Anderson/Steven Brown (Citroen C1) in the newly rebuilt and resprayed black Peugeot 107. They got into an argument with a tyre route marker on stage 5 and dropped over a minute. This allowed Cameron Davidson/Michael Cruickshank (Nissan Micra) to slip into fourth place and score Davidson’s best finish for the season. Oli Hunter/Tom Hynd (Peugeot 107) were the first casualties of the day with a gearbox failure on stage 1, although they were able to fit a replacement for the second 4 stages and managed to have some fun. The Cadwell event set a fitting challenge for the Championship finale and several drivers will now be moving up into senior rallying in the 2019 season. We wish them well and look forward to welcoming the remaining drivers plus new recruits to the Junior 1000 Ecosse Challenge in 2019.